I don’t know if this is the start of a regular feature here, but it could be. An estimate by the Center for Science in the Public Interest, an advocacy group, suggests that mechanically tenderized beef could have been the source of as many as 100 outbreaks of E. coli and other illnesses in the United States in recent years. Those cases affected more than 3,100 people who ate contaminated meat at wedding receptions, churches, banquet facilities, restaurants, schools and in their own homes, the center said. 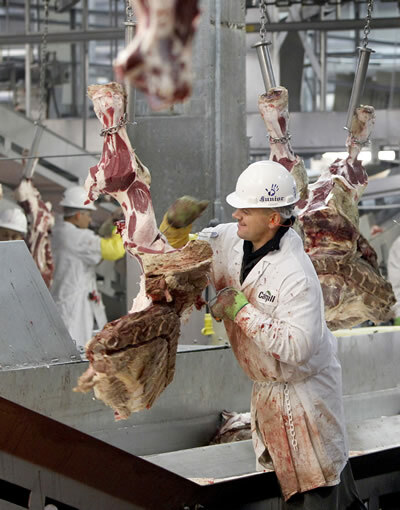 But that’s just one of the key findings from The Star’s investigation, which examined Big Beef’s processing methods and the hazards they can pose for human health. The Star examined the largest beef packers including the big four— Tyson Foods of Arkansas, Cargill Meat Solutions of Wichita, National Beef of Kansas City and JBS USA Beef of Greeley, Colo. — as well as the network of feedlots, processing plants, animal drug companies and lobbyists who make up the behemoth known as Big Beef. • Large beef plants, based on volume alone, contribute disproportionately to the incidence of meat-borne pathogens. • Big Beef and other processors are co-mingling ground beef from many different cattle, some from outside the United States, adding to the difficulty for health officials to track contaminated products to their source. The industry also has resisted labeling some products, including mechanically tenderized meat, to warn consumers and restaurants to cook it thoroughly. • Big Beef is injecting millions of dollars of growth hormones and antibiotics into cattle, partly to fatten them quickly for market. But many experts believe that years of overuse and misuse of such drugs contributes to antibiotic-resistant pathogens in humans, meaning illnesses once treated with a regimen of antibiotics are much harder to control. It’s a fascinating and devastating look into modern beef packing (I smell a Pulitzer), and opens with the painful story of Margaret Lamkin, an 87-year old woman who almost died, and lost her colon, after contracting a virulent pathogen from an Applebee’s steak (“Eating Good In the Neighborhood”!). I feel terrible for Lamkin and no one should have to endure what she did (and wouldn’t if the Congress and regulators did their jobs instead of buckraking from beef industry lobbyists). But if we have learned anything about Big Meat it is that you should not trust it, or trust that nothing bad is going to happen. I would also note that it is not Big Meat that is shoveling their product into Americans. Lamkin and others are doing that all by themselves. Thank you for your great post warning of the dangers of the meat industry. I’m reblogging it on my WordPress, where I post vegetarian/vegan related material as well as a lot of other items with relevant and important themes. Please check it out – I already have over a dozen great followers, and you are encouraged to join them! Thanks again.